If all that comes to mind is “to maximise shareholder value”, you’re in trouble. According to Deloitte’s Millennial Survey 2015, 60% of their 7,800 Millennial respondents (those born in 1982 or later) reported that they chose to join their current employer in part because of the organisation’s “sense of purpose”. Among Millennials who were highly connected on social media – i.e., the online face of your organisation – the figure was 77%. In addition, 57% of respondents who perceived their organisation to have a “strong sense of purpose” reported a “high level of employee satisfaction” at their company, while only 23% of those who worked at an organisation that lacked a strong sense of purpose reported the same level of employee satisfaction. So having a clear organisational purpose matters to Millennials, who will likely soon (or have) make up your organisation’s largest group of employees, and should be an important part of your organisation’s talent acquisition and retention strategy. So how can a company go about crafting an effective purpose? To get a sense of what sorts of purposes would motivate Millennial employees, Deloitte asked Millennials what goals they thought businesses should pursue, and the extent to which they felt that businesses are achieving these goals. Only 34% of respondents pointed to “generating a profit” as an important goal for business. So really, it’s time to shelve “maximising shareholder value” as an organisational purpose or mission. Hint: all goals focused on creating value for society, not for shareholders. It’s the same for the broader universe of workers and executives. In Deloitte’s 2014 Core Beliefs and Culture Survey, “generating a financial return for our stakeholders/shareholders” was only the 5th most important component of purpose. Instead, respondents viewed creating products and services that benefited their customers and society as the most important component of their company’s purpose. Unfortunately, Deloitte’s surveys also suggest that simply defining a purpose for your company is not enough. Both the 2014 and 2013 Core Beliefs & Culture Survey found a clear misalignment between leaders’ and employees’ perceptions of how successfully their companies were implementing their purpose. In particular, the surveys found that executives are much more engaged with organisational purpose than employees. In the 2013 survey, 64% of executives felt that they could easily explain how they and their company served its stated purpose, but only 41% of employees felt the same way. Only a small minority of employees agreed that their company’s purpose had influenced their decision to join the company and continue to work there, while more than 50% of executives felt the same way. Similarly, the 2014 survey found that 47% of executives identified with their company’s purpose, but only 30% of employees did so, and while 44% of executives felt that their company’s leadership lived the organisation’s purpose, only 25% of employees perceived this to be the case. This misalignment in the uptake of organisational purpose is driven in no small part by a failure of communication at the leadership level. Less than 40% of respondents surveyed in 2014 felt that their organisation’s purpose was “clearly conveyed to ALL employees”. By failing to get their employees to rally behind their company’s purpose, leaders are sacrificing a golden opportunity to attract and retain top talent, to recruit committed advocates for the company’s brand, and to make it easier for employees to make business decisions that contribute to meeting the company’s long-term objectives. Moreover, by aligning a company’s employees, customers, and other stakeholders around its shared purpose, leaders can create a sense of confidence in their organisation that facilitates innovation and investment in future growth. Enviable Workplace’s Purpose at Work Survey was designed to help you to measure your organisation’s level of alignment and identify the drivers of any misalignment. 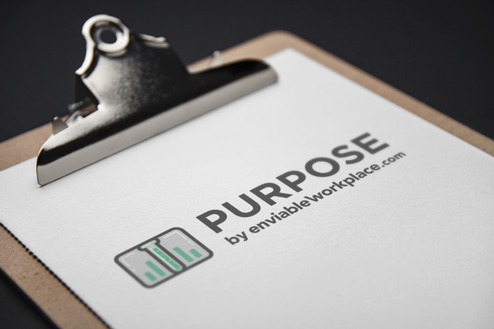 The 10-minute survey asks your employees to state your company’s purpose in their own words. We then use text analytics to compare their responses to the company’s stated purpose, which allows us to measure the extent to which your employees can even identify the purpose set by the company’s leaders. To measure alignment, we compare responses across different departments and roles. Finally, we use a custom scale to measure the extent to which employees in different departments and roles believe in and are motivated by your company’s purpose. If you are interested in beta-testing EW’s Purpose at Work Survey, we can help you to better understand your business by providing you with a report that includes a purpose alignment score and a purpose engagement score for your company (and for individual departments or roles, if your organisation is big enough). We will also provide you with a driver analysis to help you understand how your company’s levels of purpose alignment and engagement are impacting business outcomes like employee recruitment and retention. If we find a serious misalignment, we would be happy to discuss further diagnostic research that generates actionable insights about how to improve your employees’ alignment and engagement with your company’s purpose. This is a disconnect that clearly features frequently but once recognized isn’t too difficult to change. My company, Royal Services (www.royalsvcs.com) created a new 5 year plan back in January which included a new mission statement and revised core values. To get this message across to our entire team, we have utilized AV screens to broadcast a constant message of how our employees are living our purpose. Next Post: Culture Killer: Is Your Company Too Big to Change?